Quiet Time audio bundle set now ready! Needing a quiet time with God each day, but don’t know how to fit it in with your busy, hectic schedule? 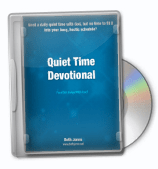 My quiet time devotional, 7-audio bundle set is JUST for you and is now ready! Click here for more details.